MANILA — With summer just around the corner, the Department of Health (DOH) has called anew on pet owners to be responsible by ensuring that their pets, especially dogs, are vaccinated and properly leashed. “Be a responsible dog owner. Vaccinate your pets, keep them properly leashed, and maintain a healthy environment for them to live in,” DOH spokesperson Dr. Lyndon Lee Suy said in an interview on Friday, noting that some dogs tend to attack and bite somebody due to excessive heat. “Siguro mas hindi comfortable ang aso, just like humans, hindi ba, pag mainit ang panahon, maalinsangan ganoon. Or ikalawa, tulad ng binanggit kanina. ang mga bata ay mas nasa kalye. That would make them prone. Parang nag-iimbita nag-aanyaya kasi mga bata naman minsan lalo na pag pino-provoke ang mga aso sa kalye,” (Maybe some dogs are not really comfortable just like humans when they are exposed to heat. And as mentioned, since a lot of children are on the streets, the dogs are prone to provocation from kids),” he explained. He said that unvaccinated dogs could be carriers of rabies, which is a human infection that occurs after a transdermal bite or scratch by an infected animal, like dogs and cats. It can be transmitted when infectious material, usually saliva, comes into direct contact with a victim’s fresh skin lesions. According to DOH, rabies is considered to be a neglected disease, which is 100 percent fatal though 100 percent preventable. It is not among the leading causes of mortality and morbidity in the country but it is regarded as a significant public health problem because it is one of the most acutely fatal infections and it is responsible for the death of 200 to 300 Filipinos annually. Aside from that, it is also recommended that pet owners should regularly bathe their pet dogs and provide them with clean food and drinks as well as clean sleeping quarters. For individuals who have high-risk occupation, the agency recommends for them to have pre-exposure anti-rabies vaccine. People who handle animals, like veterinarians, zookeepers, and animal scientists may need preventive vaccination involving three shots over one month, along with booster shots over the years to maintain the effectiveness of the vaccination. For people traveling to any part of the world where rabies is still common and they are likely to come in close contact with wild animals, doctors recommend a preventive series of the rabies vaccines before they go. The following are signs and symptoms of rabies infection: headache and fever; pain or numbness of bite site; delirium and paralysis; muscle spasms; hydrophobia and aerophobia. When bitten by a dog, victims are advised to wash the wound immediately with soap and running water to also prevent tetanus infection. Big and small wounds that have been filled with dirt are likely to develop tetanus, aside from the rabies infection. The DOH advises bite victims to consult a physician immediately or go to the nearest Animal Bite Treatment Center in their area to get the anti-rabies vaccine (if no anti-rabies vaccine has been provided prior to the bite and the victim is not sure if the biting dog has been vaccinated). 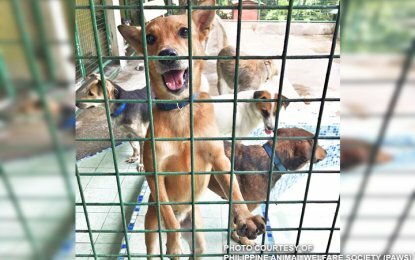 “Visit the animal bite center to get rabies vaccination immediately,” said the DOH advisory. At present, PhilHealth has case rates that pay for post exposure prophylaxis, which is a preventive medical treatment that starts immediately after exposure to a pathogen, such as a disease-causing virus, in order to prevent infection by the pathogen and the development of disease.